Olmsted Falls School District as a whole earned a rating of “Excellent” on the 2010-2011 Local Report Card released by the Ohio Department of Education last week. Local Report Card ratings are based on four components which include: Number of State Indicators Met (on annual achievement tests); Performance Index (scale of 0-120 points); AYP (Adequate Yearly Progress); and Value-Added (measure of how much growth/progress was made since the prior year). 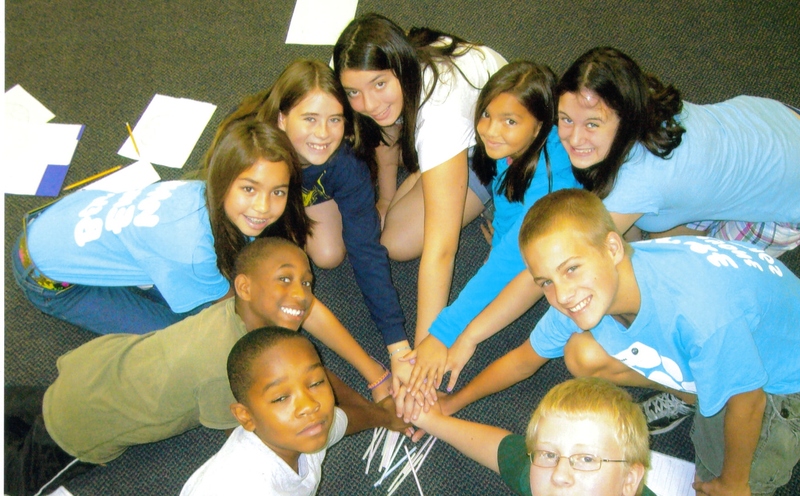 For 2010-2011, Olmsted Falls School District met 26 out of 26 State Indicators, achieved a Performance Index of 105.7; met AYP; and met the Value-Added growth measure. A new, more stringent rating system put into place by the Ohio Department of Education this year required school districts to exceed in the Value-Added growth measure at a statistically higher level in order to attain the top-level “Excellent with Distinction” rating. This more stringent requirement resulted in Olmsted Falls Schools, along with several other local school districts previously rated “Excellent with Distinction,” to drop down to the “Excellent” category. For additional background information on the Local Report Card rating system from the Ohio Department of Education, please click here. To read a recent Plain Dealer article regarding changes in the Local Report Card rating system and its impact on school districts previously rated “Excellent with Distinction,” please click here. Students, staff and parents in the Olmsted Falls School District should take great pride in all of these ratings under the new system. It may be easy to forget that our District met 26 out of 26 State Indicators, met AYP and achieved a Performance Index (105.7) that is among the top 11% in the State of Ohio. Please take this opportunity to celebrate these outstanding accomplishments. It remains the goal of the Olmsted Falls School District to be “Excellent with Distinction.” Our District will strive to regain that top-level rating across the District by focusing efforts specifically on improving the Value-Added growth measure. Thank you to our staff, students and parents for all that you do each day to maintain a high level of expectations and achievement throughout the District! Any parent or resident having questions about the Local Report Card ratings for Olmsted Falls Schools, and/or questions about the new rating system, are invited to join Superintendent Dr. Todd Hoadley in the Olmsted Falls High School Library next Wednesday, September 7th between 7 – 8 p.m.
Over the past several years, Olmsted Falls School District has made a concerted effort to improve the choices available for students in its school cafeterias. Whole grain breads and pastas, wheat-crust pizzas, and daily fresh fruit, vegetable and salad bar offerings are among the innovations that have improved school lunch options for kids. The latest change in District cafeteria menus is the elimination of chocolate flavored milk. Beginning with the start of this new school year, all school building cafeterias will be selling only low-fat white milk – which contains nearly half the amount of sugar (12 grams) as compared to the chocolate variety (22 grams). It is these small steps and changes that can slowly make a difference over time in combating growing obesity rates among students across the country – including locally here in Olmsted Falls. In recent years, a federal mandate has required school districts to track student BMI (Body Mass Index) information to determine the overall health of student populations. Last year’s BMI results for Olmsted Falls Schools showed approximately 31.5% of Olmsted Falls’ students in grades K-9 were classified as either overweight or obese. This marked an increase of approximately 3% from the previous year’s BMI results. Steps such as the removal of chocolate milk from cafeteria menus are becoming a growing trend across the nation. Last May, Los Angeles Unified School District, the second largest school district in the country, also removed chocolate milk from its school lunch menus. 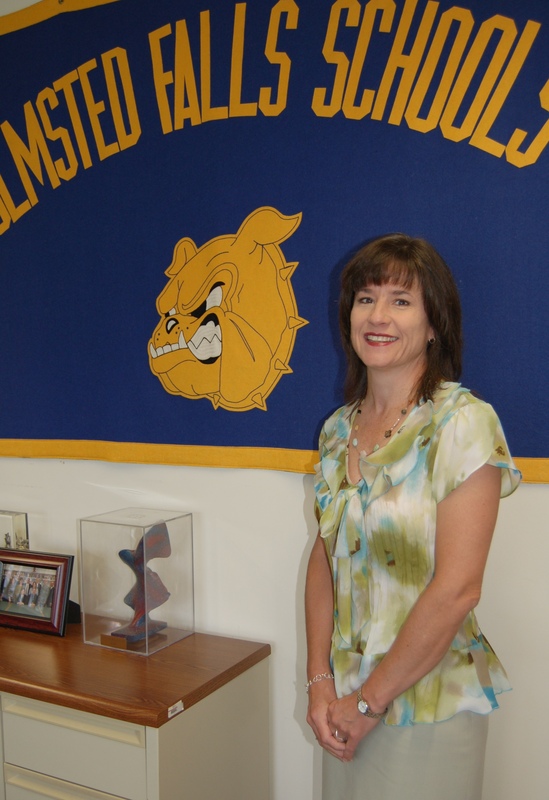 According to Olmsted Falls School District’s Director of Food Services Mrs. Denise Tabar, Bulldog parents have been supportive of the District’s efforts to continually improve upon healthy cafeteria offerings. In a survey of 1st through 8th grade parents conducted last year, parents were asked if their students would drink white milk if it were the only type of milk served. Responses came back 3 to 1 answering yes. For questions about school lunch menus or BMI data in the Olmsted Falls School District, please contact Mrs. Tabar at 427-6440. THIS FRIDAY’S NON-CONFERENCE VARSITY FOOTBALL GAME KICKS OFF AT 7:30 P.M. – THIS IS THE ONLY VARSITY GAME THIS SEASON WITH THE LATER KICK-OFF! ALL FUTURE SWC FOOTBALL GAME KICK-OFF TIMES ARE 7:00 P.M. The Varsity Football game against Medina Highland this Friday, September 2nd is a non-conference game and will begin at 7:30pm. However, for all future Southwestern Conference Varsity Football games, the new starting time is 6:30 pm for the coin toss, band pre-game performance, national anthem, etc. ; and 7:00 p.m. for kick-off! This Friday’s non-conference game is the ONLY game this season with a 7:30 p.m. kick-off. Last year, approximately 300 young Bulldogs joined the OFHS Cheerleading squad to cheer on the Bulldog Varsity Football team. Lines of girls followed the lead of Olmsted Falls High School cheerleaders with chants and routines that were learned during the annual Bulldog Mini Cheer Camp program. This program will be offered again this year. Please click here to download the registration form. Building administrators, faculty and parents all pitched to show our youngest Bulldogs the ropes as kindergarten officially got underway at the Olmsted Falls Early Childhood Center last Thursday. There was no shortage of friendly faces and helping hands along the way as students learned how to get from the buses to their classrooms. This year marks the start of the third year of operation for the District’s Early Childhood Center (ECC) dedicated exclusively to the education of our preschool and kindergarten students. Look out here we come! 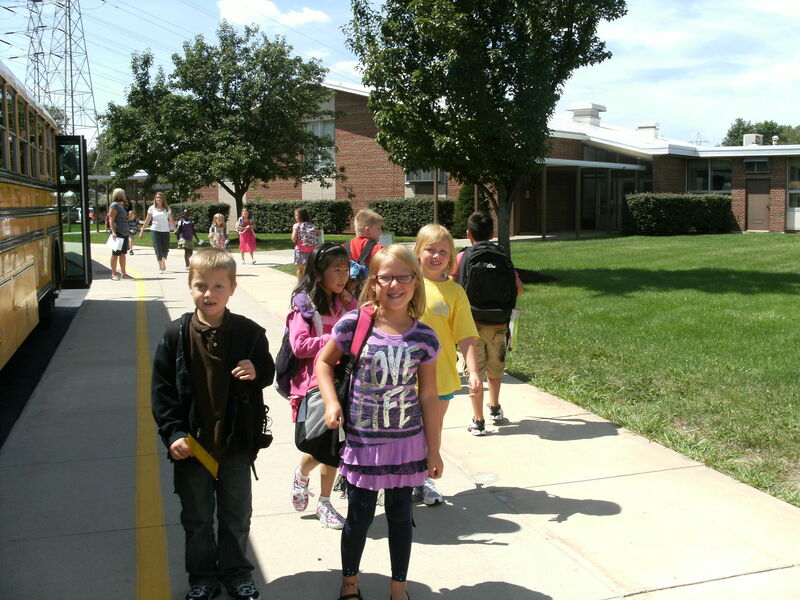 Kindergarteners did a great job getting off the bus on their first day. Bus driver congratulates each kindergartener on a great first ride with a high-five! Parent volunteers from OECPTA help guide kindergarteners to their class on their first day of school. Falls-Lenox OPEN HOUSE for South Learning Community (7 pm) – Parents please meet at 7 p.m. in the cafeteria. **Please Note: Presentations in both the cafeteria and the classrooms are geared toward parents. It is suggested that you try to make arrangements for childcare, so that you can give your full attention to the information being presented. Babysitting services will not be provided this year. This Saturday, September 3rd – A door-to-door effort to inform the community about the 5-year P.I. levy will take place from 10:00 a.m. to Noon. Any parents interested in assisting with this important effort should meet at the Board Office at 9:30 a.m. Levy literature will be provided. Tuesday, September 6th @ 7:00 p.m. – Attend the next “Come Help” meeting. 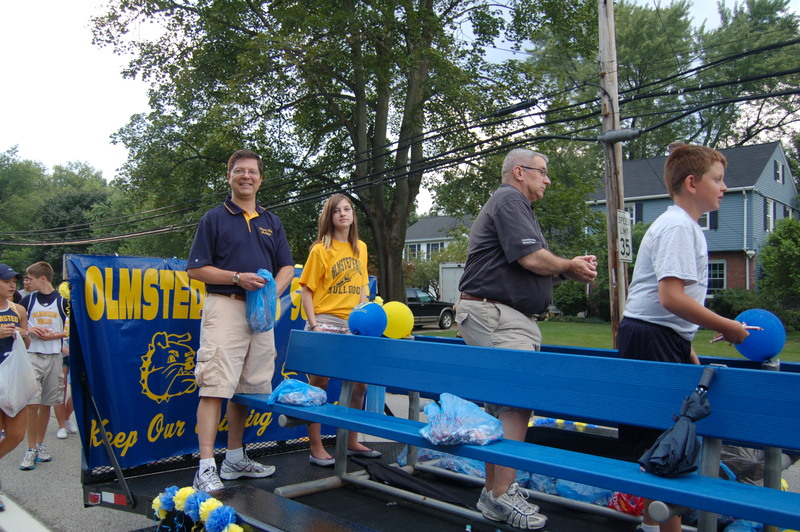 Join other Bulldog parents and staff in expanding campaign efforts. Display Your Yard Signs! – Anyone who has a “Yes for Schools” sign from the May campaign tucked away in your garage, now is the time to pull it out and display it once again in your yard. For those in need of a yard sign, you may pick one up at any of the upcoming Open House events OR simply e-mail prideinolmstedschools@gmail.com (Subject Line: Yard Signs). Please include your street address and indicate if you would like a “Yes for Schools” sign, a “Bulldog Pride” sign, OR BOTH! Pride volunteers will deliver the sign(s) right to your yard! Thank you to all of our Bulldog staff, students and parents for a great start to the 2011-2012 school year! 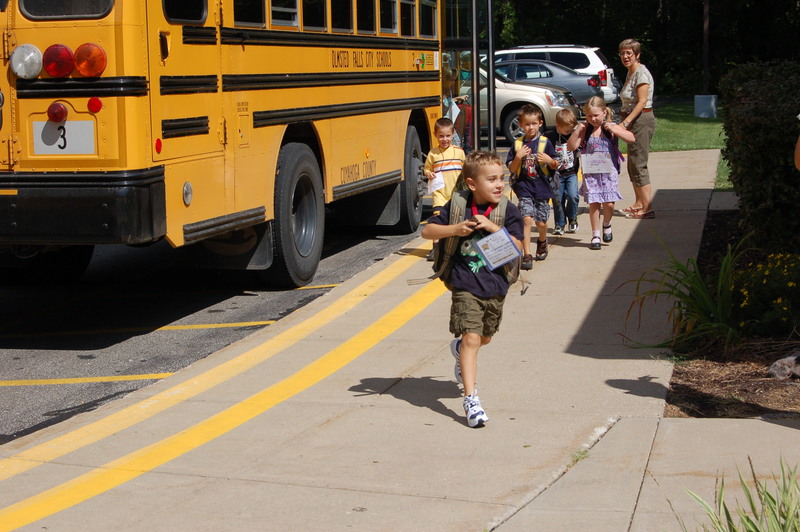 Excited students arrive at Falls-Lenox for their first day of school on Tuesday. 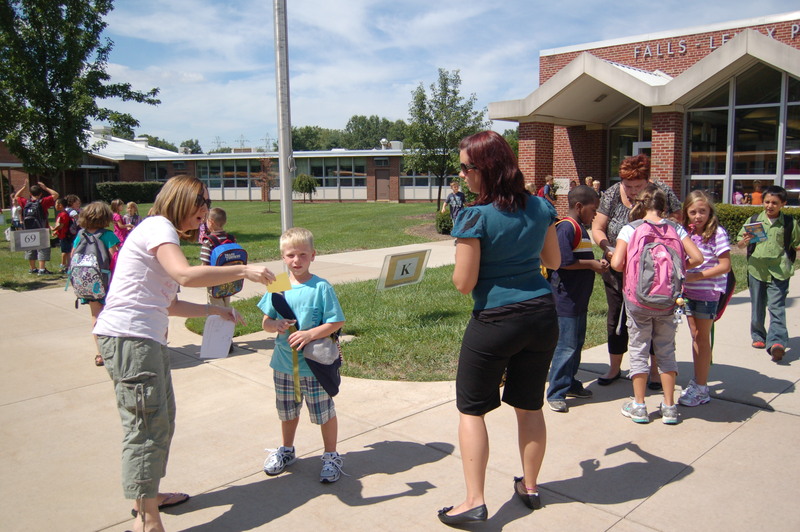 PTA volunteers at Falls-Lenox help guide students on first day. Thank you PTA! New Falls-Lenox Principal Colleen Longville wishes students well after a great first day. 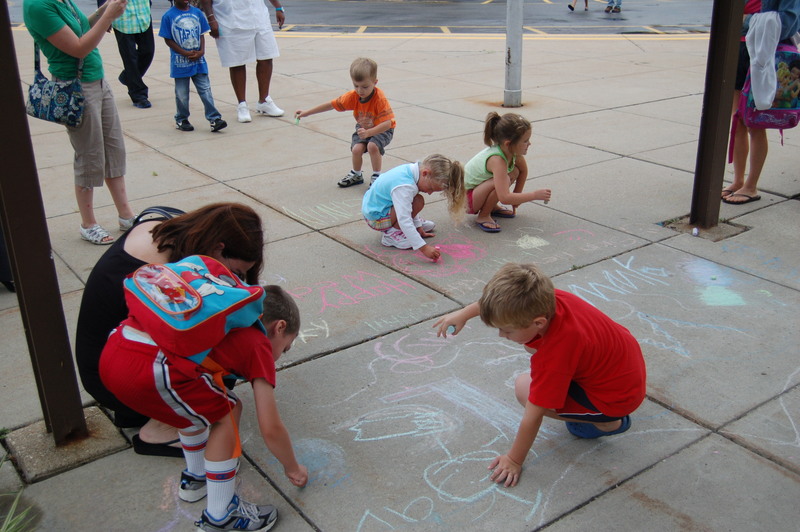 Kindergarteners leave their mark outside as they arrive at the Early Childhood Center for Orientation. 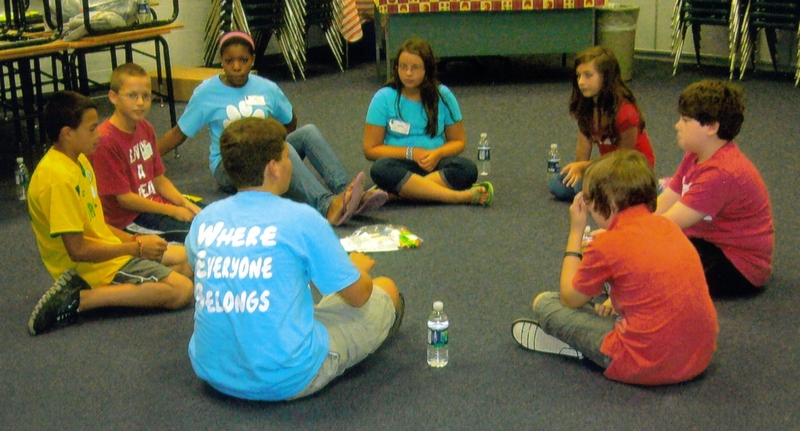 More than 90 eighth grade students served as WEB leaders for the special WEB (“Where Everyone Belongs”) Program put on for incoming sixth grade students. WEB leaders applied and were selected to participate at the end of last year. Each went through 2 days of special WEB training (10 hours total) on August 11 & 12. WEB Orientation was held Monday August 15th from 8 am – 12:30 pm. More than 250 sixth grade students attended. The day began with a group assembly in the Middle School gym which included many activities with both the new sixth graders and 8th grade WEB leaders. The WEB leaders also took groups of 6th graders to individual classrooms and did activities with their groups to get to know them better, challenge teamwork skills and provide advice on being successful in the Middle School. The WEB leaders also took the 6th graders on a tour of the building explaining all of the areas of the school. Finally, the 6th graders had a chance to find their locker locations. The WEB leaders also attended the 6th Grade Open House on Wednesday, August 17th, and the new student orientation on Friday August 19th. The next big WEB activity will be the BBQ and home varsity football game in September. Emergency Contact Cards were sent home with students in grades 1-5 and grades 7-12 on the first day of school. (6th grade students received their Emergency Contact Cards at Open House on August 17th.) PARENTS: Please review all information carefully to confirm accuracy and return to your child’s building no later than this Friday, August 26th. Please also remember to carefully verify that your e-mail address is correct on your student’s Emergency Contact Card(s). A current e-mail address in our database helps ensure you will receive notice of weekly District blog updates, as well as periodic building-specific information. The Athletic Boosters organized another successful “Meet the Teams Night” at the High School football field last Saturday. Thank you to all the players, coaches and families who attended this annual event. We wish all the Bulldogs great success as you represent Olmsted Falls in your chosen activity. 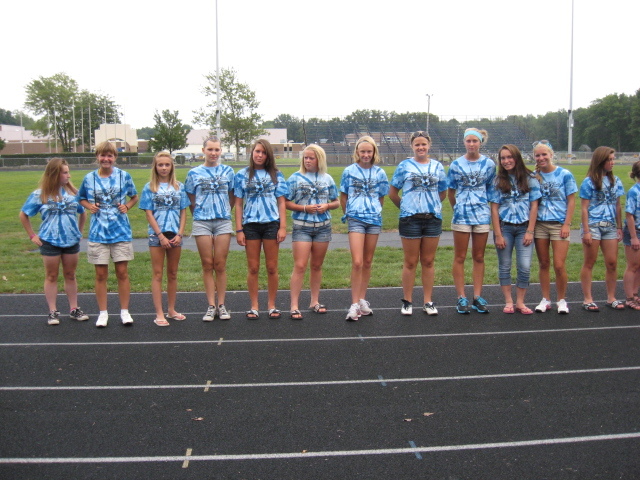 For more photos of “Meet the Teams Night,” please click here. Please note that the schedule of all Southwestern Conference Varsity Football games has changed for this school year. The new starting time is 6:30 pm for the coin toss, band pre-game performance, national anthem, etc. The new kick-off time is 7:00 pm. The date of the OFHS Prom for this year has been changed to May 19, 2012. The prom had previously been scheduled for May 5th. Parents of High School students, please note the change in your District calendars. Falls-Lenox Open House for West Learning Community (7 pm) – Parents please meet at 7 p.m. in the cafeteria. **Please Note: Presentations in both the cafeteria and the classrooms are geared toward parents. It is suggested that you try to make arrangements for childcare, so that you can give your full attention to the information being presented. Babysitting services will not be provided this year. Falls-Lenox Open House for East Learning Community (7 pm) – Parents please meet at 7 p.m. in the cafeteria. **Please Note: Presentations in both the cafeteria and the classrooms are geared toward parents. It is suggested that you try to make arrangements for childcare, so that you can give your full attention to the information being presented. Babysitting services will not be provided this year. All medication must be sentin the original container. Only parents can bring medications, including over the counter drugs to the clinic. The only exceptions are inhalers and Epipens if the student has a physician signed “self-carry” order. Orders for prescription drugs must be signed by the physician and parent. Orders for over the counter drugs require only a parent signature if dosage is per package instruction. Please call your child’s health clinic if you have any questions. Thank you for your cooperation. 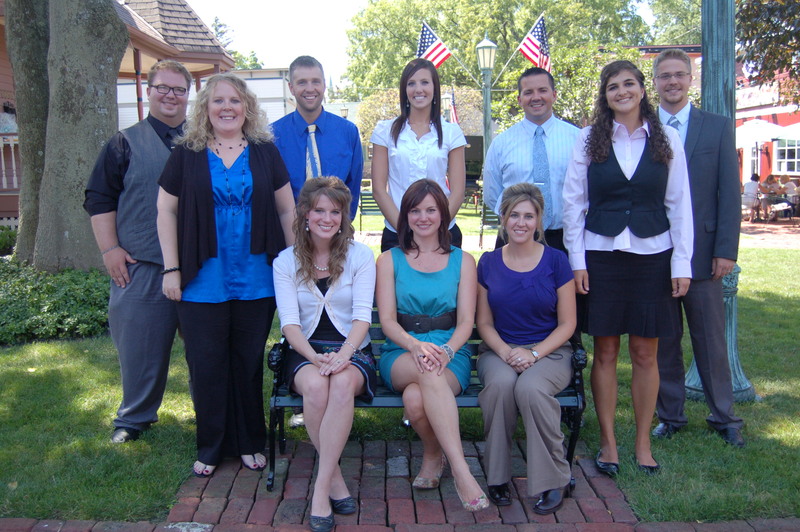 Olmsted Falls School District is pleased to introduce new Bulldog staff members – and some existing Bulldog staff members in new positions – for the 2011-2012 school year. When you visit the schools, please welcome them too! 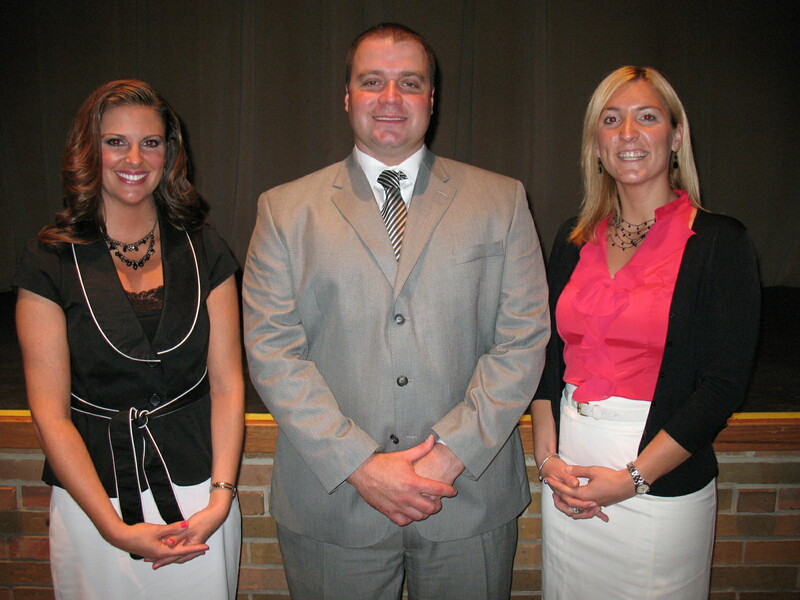 New Assistant Principals Miss Lisa Williams (Falls-Lenox), Mr. Nate Artino (High School), Miss Krista DiRocco (Middle School). Back Row (L-R): High School Language Arts Teacher Chris Wagner; Falls-Lenox Tutor Brianna Smith; High School Math teacher Justin Zrenner; High School Math teacher Alyssa Ropes; High School Social Studies Teacher Brian Insley; High School Science Teacher Brittany Rasmussen; and Middle School Music Teacher Ryan Patterson. Front Row, Seated (L-R): Intermediate School Long-Term Substitute Teacher Danielle Hicks; Falls-Lenox 3rd Grade Teacher Andrea Beltram and High School Counselor Lauren Peterson. District officials recognized employees for their years of service to the District during the annual General Staff Meeting held Monday, August 23rd. Employees with 1, 5, 10, 15, 20, 25 and 35 “Bulldog years” were acknowledged for their contributions to the District’s success. Congratulations to all and thank you for your service! “20 Year Bulldogs” Michele Buck (Middle School), Daniel Dame (Falls-Lenox), Franca DeMuth (Falls-Lenox), Jean Double (Intermediate), Teresa Haun (High School), Bernie Lofredo (High School), Karen Megery (Falls-Lenox), Tammy Mlady (Falls-Lenox), and Debra Weisbarth (High School). 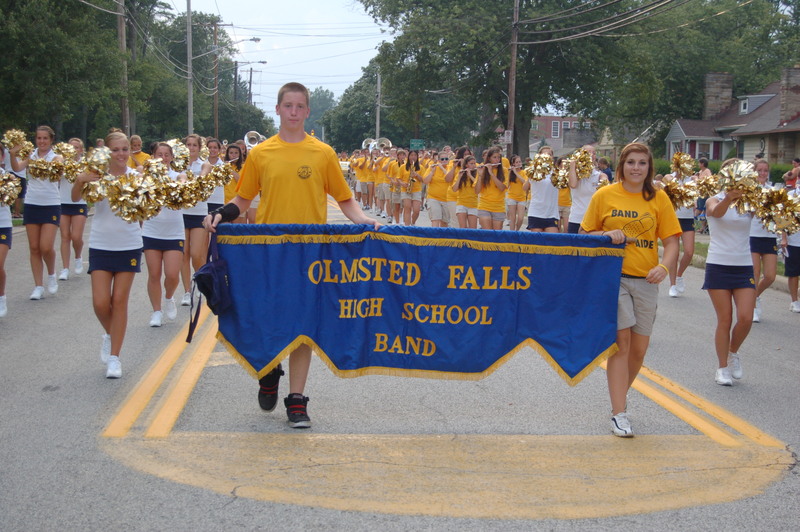 In the annual tradition, Olmsted Falls Board of Education members and District administrators joined the OFHS Marching Band, Bulldog athletes and mascot on the parade route in the Heritage Days Parade held August 18th. 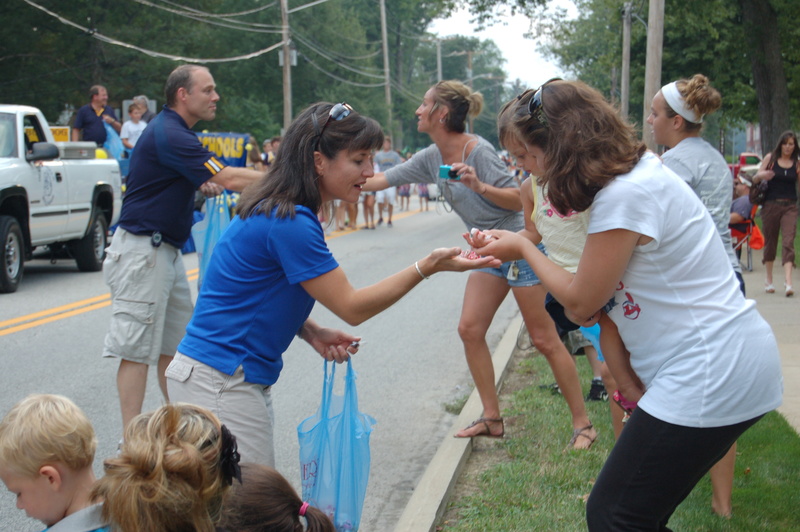 Students, families and community members lined the streets for the annual event…and for the candy. Please enjoy the Heritage Day Parade photos below, and click here to view a complete photo gallery. The information campaign to educate parents and the greater Olmsted Community about the critical importance of the 5-year Permanent Improvement levy on the November 8th ballot is officially underway. A special thank you to those volunteers who began work to get things rolling this summer. Thank you also to all of those parents who have taken “Yes for Schools” and “Bulldog Pride” signs to display in your yards – this greatly helps to increase awareness! Saturday, September 3rd – A door-to-door effort to inform the community about the 5-year P.I. levy will take place from 10:00 a.m. to Noon. Any parents interested in assisting with this important effort should meet at the Board Office at 9:30 a.m. Levy literature will be provided. Family Council is a monthly meeting at the State Support Team facility (in Valley View) of parents and caregivers of students with disabilities receiving special education services in Cuyahoga County. Members are appointed by the Superintendent of their school district. The purpose of Family Council is to provide a forum for families to exchange information and study various topics relating to the education of their children with disabilities. Each month an educational update, along with a specific presentation topic is offered. At this time, Olmsted Falls has a vacancy on the Family Council. If you are the parent or caregiver of a child receiving services through an Individualized Education Program (IEP) and are interested in serving on this council, please contact Merritt Waters, Director of Student Services, at 440-427-6530 or mwaters@ofcs.net for additional information. Sunday, September 4th from 7 pm to midnight. To volunteer, please e-mail ofholdm@att.net with your contact information and shift availability. Also, people can come up and volunteer at the event training meeting which will be held Monday, Aug. 29th from 6 to 7 pm in the High School Library. All volunteers will receive a confirmation e-mail and receive training at the High School Library on August 29, from 6-7pm so they know what do to during their shift. Plus, volunteers receive free refreshments during their shift(s) and an OFAB volunteer t-shirt. Do not worry if you do not play cards. That is NOT a requirement. We hope that everyone is enjoying the summer break. With just two weeks left before the start of the new school year, we wanted to take the opportunity to provide a summary of important back-to-school information. 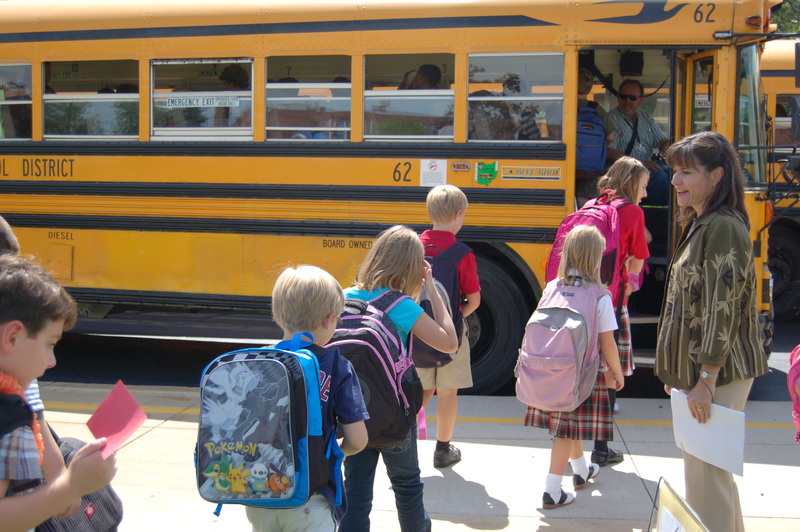 Beginning with the first week of school, Olmsted Falls School District will again publish this blog on a weekly basis – each Wednesday that school is in session. Please be sure to review the e-mail address that appears on the Student Emergency Medical Card. This is the e-mail address that will be confirmed/updated in the District’s main database and pulled to use for this year’s weekly blog alerts, as well as periodic building specific information. If you have any questions about your e-mail address, please contact Kim Petrina at 427-6020 or via e-mail at kpetrina@ofcs.net. For Early Childhood Center Supply Lists, please click here. For Falls-Lenox Supply Lists, please click here. For OFIS Supply Lists, please click here. For OFMS Supply Lists, please click here. “COME HELP” MEETING – THIS MONDAY, AUGUST 15TH @ 7:00 P.M.
All parents are invited and encouraged to join Superintendent Dr. Todd Hoadley and members of the Pride in Olmsted Schools Committee this Monday, August 15th at 7:00 p.m. in the Olmsted Falls High School Library Media Center. Our District is again at a critical cross-road and we need your help. Get informed and get involved! The passage of the 2.8 Mill 5-Year Permanent Improvement (P.I.) Levy on the upcoming Nov. 8th ballot is an important component to the District’s ability to renovate aging facilities and stretch out the length of time before the next operating levy is needed. Passage of this 2.8 Mill 5-year P.I. Levy in November will NOT increase the current level of taxes paid by residents. Meeting agenda will include brief overview of November P.I. levy, opportunity for questions and information on how you can help. The July/August Back-To-School Issue of Our School Report will be arriving in all community homes and businesses within the next few days. The special back-to-school edition includes information on building start/end times, lunch fees, school fees, transportation and more. To access a PDF file of this important issue, please click here. Please click here to download a copy of the 2011-2012 Academic Year Calendar for Olmsted Falls Schools. The Olmsted Falls Athletic Boosters Club has been chosen to run the downtown Cleveland Nautica Charity Poker Festival on September 1-4. 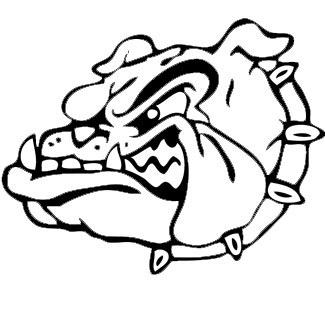 This is a huge opportunity for the Athletic Boosters to raise a substantial amount of money, which will be placed into a reserve account and be used to benefit Bulldog athletic programs and athletes. Past organizations have raised up to $40,000 running a Nautica Charity Poker Festival! All volunteers will receive a confirmation e-mail. All volunteers will receive training at the OFHS on August 29, so they know what do to during their shift. Plus, volunteers receive free refreshments during their shift(s) and an OFAB volunteer t-shirt. Do not worry if you do not play cards. That is NOT a requirement. All volunteers must be secured by August 15th. So please check schedules and advise OFAB as to availability as soon as possible. Family and friends who are 18 or older are invited to volunteer too. There is a big volunteer number to hit, so maximizing volunteer outreach is crucial! Thanks in advance for your participation! It’ll be a great time for a great cause! 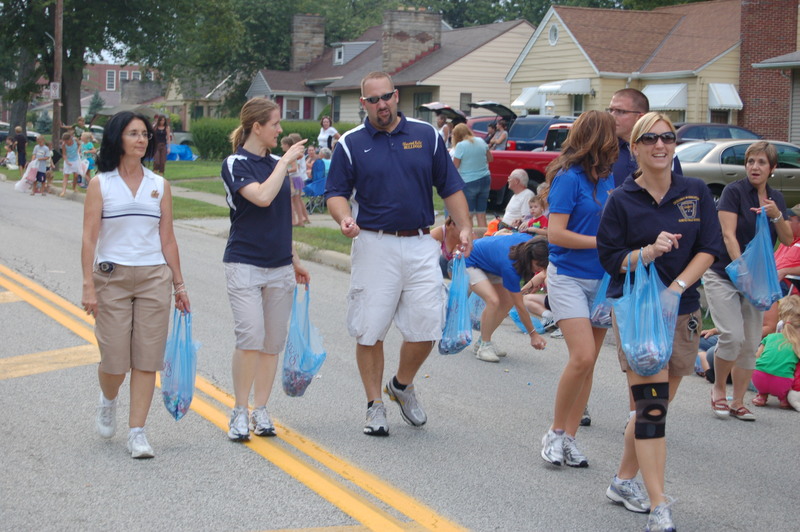 HERITAGE DAY PARADE – NEXT THURSDAY, AUGUST 18th – 6:30 p.m. – Don’t miss this annual community event! Parade will step off from Falls-Lenox School and follow traditional route. Don’t forget your candy bags!